Well here I am, finally writing another blog entry! I took my time! On the weekend I visited Arthur and Yvonne Boyd's property 'Riversdale' and 'Bundanon' on the Shoalhaven River about 20mins from Nowra, NSW. I organized a group visit with the Friends of Sturt for an overnight stay and play. The 'Riversdale' property is one of the most inspirational places I have visited for a long time - I have been looking forward to it for ages! I started with some spinning looking out over the amazing view, because I hadn't spun for years and I was really missing it. The photo is of some of the other FOS gals. But what I really loved was going for walks. I followed the creek for a while... And found some natural weaving! And settled down under a palm leaf. Where I started noticing the micro-world... as I usually do! - Beautiful, luscious different types of moss. And I do love the beautiful details of lichen. This is a great illustration of L-systems which I have been investigating lately. And beautiful buttons of fungi - I find the different browns in this stunning! And cute little orange buttons... And this little stunner in reds - never seen it before. 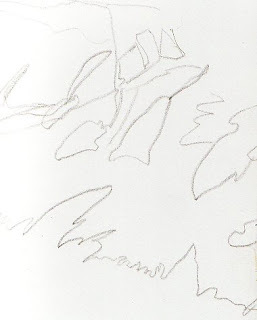 And I did actually do a little bit of sketching - just some quick linework of the shadows falling on the page. Had a very rejuvenating time!